RFCS funded project in which DYNAmore works with partners to develop a simulation framework to accurately model the complex deformation and forming behaviour of TWIP steels. TWIP4EU is a RFCS funded project in which DYNAmore works in close collaboration with Fraunhofer Institute for Mechanics of Materials, ESI GmbH, Faurecia Autositze GmbH, Swerea KIMAB and Salzgitter Mannesmann Forschung GmbH. The aim of the project TWIP4EU is to develop a simulation framework to accurately model the complex deformation and forming behaviour of TWIP steels. The developed model will be implemented into commercial finite element codes to ensure its availability for industrial use. It is expected to go beyond the current state-of-the-art, thus facilitating the introduction of TWIP steels in the automotive industry. The results will also be highly beneficial to describe the crash behaviour of TWIP steels. Further sub-goals are the detailed experimental and simulative analysis of TWIP steels with respect to the multi-axial material behaviour, nonlinear loading paths and Bauschinger effect, as well as the validation of the developed model on complex forming processes including spring back behavior and the validation of the virtual design process. TWIP4EU proposes a new approach to model the macroscopic thermomechanical behaviour of TWIP steels by using micromechanical quantities as internal variables to account for the complex deformation behaviour. In contrast to available models, the initial yield surface and also the evolving yield surfaces are taken into account. Another highly innovative approach is the use of virtual experiments to supplement real conventional experiments for sheet metals. Finally, the proposed research is also expected to lead to improved knowledge about the complex microstructure evolution of TWIP steels during deformation. 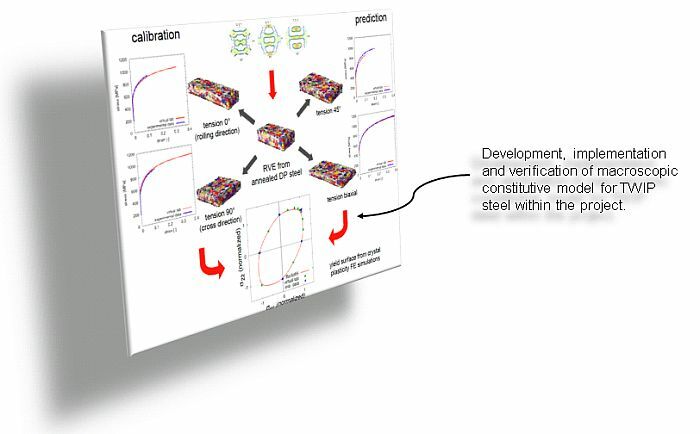 For this purpose, advanced experimental analysis techniques like in-situ EBSD-analyses (Electron Backscatter Diffraction) will be employed and combined with modern simulation strategies based on the specific microstructure of the considered TWIP steel. © 2019 DYNAmore GmbH, DYNAmore Swiss GmbH, DYNAmore Italia S.r.l. All brands, trademarks and images mentioned are property of their respective registered owners. The right of use was kindly granted by Adam Opel AG, Audi AG, Autoliv B.V. & Co. KG, Benteler SGL GmbH & Co. KG, BMW AG, Daimler AG, Dr. Ing. h.c. Porsche AG, DOW Inc., e-Xstream enginering SA, Faurecia Automotive GmbH, Hilti Entwicklungsgesellschaft mbH, Jaguar Ltd, Johnson Controls GmbH, Karlsruhe Institute of Technology (KIT), Rheinmetall Landsysteme GmbH, Sony Ericsson Mobile Communications AB, Still GmbH, TAKATA-PETRI AG, ThyssenKrupp Steel Europe AG, University Stuttgart and Volkswagen AG.